I was on Midlands Today at lunchtime apparently (and Radio WM) and am in TAKE A BREAK magazine in the issue out tomorrow! Hello there! I went up to Hanforth on Monday to see Rob (not 'Rod' as I accidentally typed on a previous blog!) and Sarah - both of who I lived with in halls of residence when we were all at uni in Manchester. 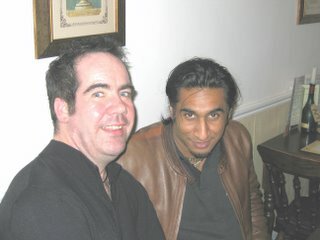 I got to Stockport on Monday night and we went for a few drinkies and ate and chatted until about 2am. On Tuesday we had to wait in most of the day because they were having a table and TV delivered. In the early evening met up with the ever-radiant Jennifer (a school friend I hadn't seen for about 16 years)..Then R, S and I watched an amazing huge-screen version of War Of The Worlds. Rob has a cinema room - (which doubled as my bedroom for a couple of days!) Many beers later we were eating delicious food and spilling delicious wine...ands cheey puffs! This morning we headed out and walked to Wilmslow then treid to get to Style across a country park (v. muddy) and got lost, ending up near the airport in a pub called the Honey Bee on the Altricham Road. I got a taxi back to Stockport and really had to concentrate to not fall alseep and wake up somewhere Southern! I have photos and will add them asap....Got busy couple of days catching up with work and stuff before hitting Notthingham at the weekend for Mandy's 30th! Hurrah! Wow its been a busy one and will be a busy one next week so excuse the way I rush through my journal! We got the bus to London. It only took just over an hour and we were there before 6.30am...We had to be at the studio (in the Whiteley Centre, Baywater) for 8am...so had plenty of time. Although we were very early we waited by the wrong Tesco....so only got in bang on 8! We were taken to a Starbucks and given a sheet as to what subjects would be discussed on the show and who would be on it. Matthew Wright was off with toothache so it was presented by Anne Diamond. It was good fun and I got on TV a lot because I was wearing a multi-coloured jumper and was generally smiling! What was sad was some of the audience (there were only about 15 of us) come every day! WHY? We met up with Kirsty about 11am in South Kensington and spent a day 'DOING' London. 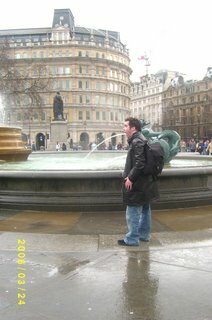 this included Piccadilly, Trafalgar Square, Covent Garden (lunch), Oxford Street, Regent Street,. 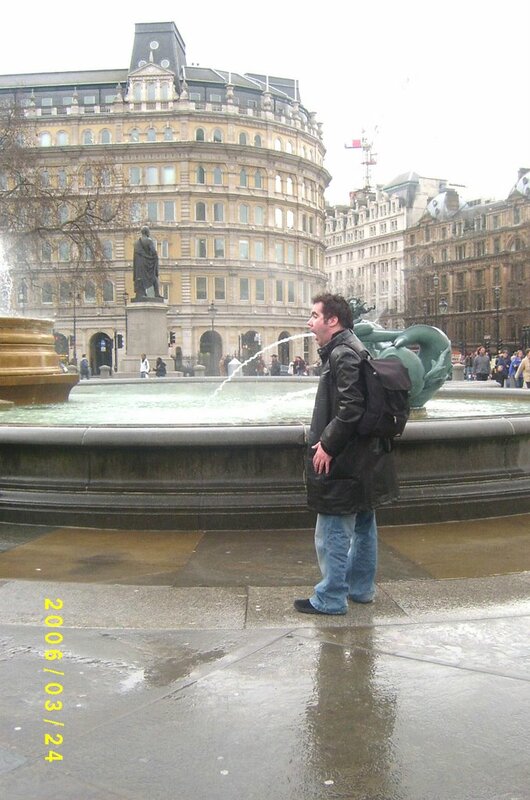 Leicester Square...A LOT of walking! Frank left about 4ish and Kirsty and I found a pub, near Liberty (The Argyll Arms on Argyll Street) and got merry on Taylor's Landlord Ale. We met up with Laura after she finished work and went to Soho...to an Italian restaurant called 'Italian Grafitti'. On Saturday morning Laura was going back to Cannock Wood! (For Eddie's 50th) So I got the bus and tube with her as far as Victoria and got my bus back to Oxford and met Mr W at the Park 'n' Ride. He lives in an estate which seems to have had the facilities taken out! So....we had a snack and bussed into Oxford. By the time we got back to the house..via a pub, many shops and a European Market.....I was shattered. On the media front. Apart from The Wright Stuff and Radio WM (Isn't that enough?) my village news and a feature I wrote about the ghosts of Nunswell Park are in the 'The Mercury. '..I have an article in 'Take A Break' next week. Thanks for all the texts from people who 'saw you on TV again'....my phone was on burn-out mode! If Take-A-Break issue 14 is out...I am in that as well....Well it keeps the bank manager happy! Radio WM have given me a day 'in the office' with them later this month. More contact building. I hope to take up Midland Today's offer of a work placement soon too. I almost live at The Mailbox! Just had a really nice e-mail from Midlands Today actually form the health reporter who reckons I am the 'best PR person he has ever met' . Perhaps, being a top TV reporter, he could be a reference for me!!! Well off for a meal at the Chet in Stafford with Victoria. I was going to their house, but her hubbie Colin has got a cold and I don't want one of those...Love and bubbles to one and all! Oh yes and we bumped into Tony Raba...blast from the past eh? He was in top form. He still goes shooting little animals and drinks from Britain! Well I think I told you about Sunday....my cousins came and we had a meal at the PG....I had writing to do in the evening, including the 'village news' for the Mercury....but I had trouble staying awake. 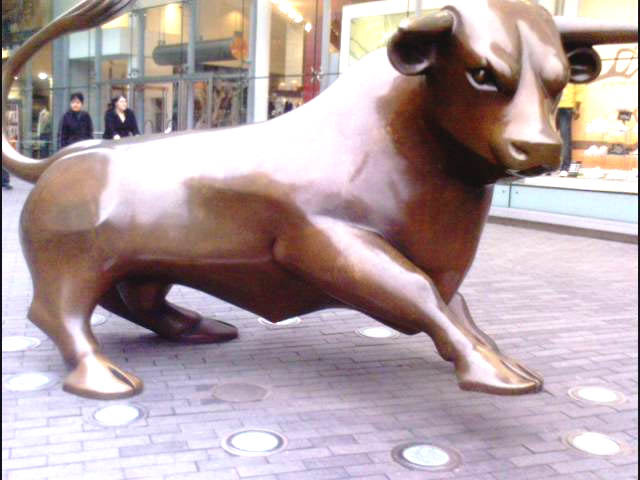 I took a photo of the 'bull' form the Bull Ring (just like a tourist) and will put it on the blog somewhere. I regret going for a cycle before shopping because I was very tired by the time i got home....the train journey and the general grind of the city may have had something to do with it too! Why does one always feel dirty after a day in Brum...not in a 'shame' way...but a grubby way? In the evening I did more work on updaying my portfolio as the docs have given me the all clear to work full-time again...and working for someone else must be better than freelancing! The air-con in an office atmosphere and the germs circulating were a problem close to my transplant. I am concentrating my portfolio on not just the stories I have done, but the ones I have got into the paper written by other....the PR part of my work. I think my portfolio was too full of stuff from the Express & Star too. I have also included magazine and internet stuff for the first time....I think it reflects what I do a lot better now. Then I went to Stafford. I met LC (the global Yam Yam) then Dave (who I hadn't seen since before the transplant) and then bumped into another former colleague Victoria (who by chance I am having dinner with tomorrow). She was my last boss at the E&S and we are each other's references too. Dinner with Victoria and hubbie Colin is always good. I was friends with her when I first worked with her and then both went to another paper and worked together again. AND we still get on! So how are we? (Collective answer please!) I hope you have all been cheering on the English at the Commonwealth Games and booing those Scots who get all the publicity for being 'brave'. I went to Cannock to pick up my travel tokens (always useful for taxis) and it was like musical chairs. Everyone sat in a circle, moving up a space when one became free. You’ve heard of the Circle of Life? Well this was the circle of death. Everyone looked either too well to be there or too ill to be there….Wonder which category I was in!!! My cold reached its peak and I was feeling very sorry for myself and vowed not to go cycling until it was better as each morning seems to be snowy and cold. I went to Stafford in the late morning to give in an application and I managed it, despite an unwelcoming person telling me off for going to the wrong building. I gave a speech that night at The Terrace hotel for ’41 Club’ – which is the club of ex Round Tablers from Brownhills, that Dad used to be a member of. The food and company was top class though! Tuesday I drove to Burton at some unearthly hour to the Connexions office for a seminar on running my own business by a Customs and Excise woman. It was useful. Interesting mix of people there too. AND lots of nice Traidcraft coffee. A38 untroubled. So I had to go to give me tax disc in and get a new one for a year and claim five months back on the last one…. (or at least get a form) I have decided that I like Shrewsbury. Met up with Peter and his wife. Our family met Peter, his ex Anne and their ‘kids’ (about my age) Sarah and Dylan in about 1998. His new wife seems good for him. I had a double take in the gym spa pool. I thought Berangere was there. It was a double. She MUST have been French. English people don’t look like that. I went for a drink with Frank and Erik at the PG in the evening and as usual we put the world to right! Thursday mum and I met our Financial Advisor in Walsall and then did the shops. I went to the gym in the afternoon as I have done most days this week. And then my head was so full of facts and figures from this morning I couldn’t sleep. So I put something on e-bay (please but it somebody) and wrote this entry. On Friday night I spent the night in Willenhall courtesy of Erik and Diana. We ordered an Indian (he came!) and went to a pub, decorated for St Patrick’s night but empty! It was like an atheist funeral! They have a very big TV in the spare room. Ideal for watching Bill Bailey and the Commonwealth Games (who would have thought those two items would be mrntioned together…..ever. I got back home at lunchtime on Saturday and went to Stafford to do functional stuff and buy a new portfolio. I splashed out on the Corinne Bailey Rae CD….oooh get me! So its been a bit of boring few days blog wise as I have just been doing ‘normal’ things. But that’s a good thing….a very good thing n’est pas? Tonight is Tracey's 40th and tomorrow the cousins are coming over for lunch....Party on Wayne,..duuuuuuuude! Look another pic from my Newcastle escapade. I got a complaint I don't put the links in often enough.....so here's a few to get on with. Oh yes...that's the lovely Sarah in the photo...not me! This blog has now had 9,000 visitors...WELL DONE EVERYONE! I am full of cold so have had a very dull weekend! I went to the gym to be 'Jodie'fied and bumped into Fay (in the hot tub). Talk about blast from the past eh? I have been busy writing. I have the village news to finish + a talk to give to Brownhills '41' Club about transplantation tomorrow AND have to finish an application I'm doing. Perhaps this cold is God's way of telling me to stay in and get on with stuff.....and its snowing! SInce I didn't have a coming home pasty after my travels, I am thinking of a 'delayed 30th/new lungs/homecoming' do at the Park Gate....Graham said a long time ag he'd give me a room for it. Whaddyathink? Back The Kid has today launched a petition to call for better access to care for children with cystic fibrosis (CF), the UK's most common life-threatening, inherited disease. Back The Kid is inviting CF patients, their families, friends, healthcare team and the general public across the UK to visit www.backthekid.com, also launched today, and register their support. I am currently tapping mt toes to Jimmy Somerville's greatest hits. Shame on me. Ricky Gervais, Doctor Raj and Sarah C! It was a speech therapy thing to try and sort out my voice, which is still croaky after all the tubes inserted through my larynx over the last few weeks. There was the obligatory hypo woman, telling everyone about all her problems. The silly woman was so old she deserved to have ailments and seemed to revel in them! Why is it the older we get the more we enjoy bring everyone with their problems. At least you guys have the choice whether to read my blog or not. I’m afraid the rest of is in this ‘group’ were a captive audience. Everyone else seemed pretty normal. Although there were too many coughers and sniffer to make me feel comfortable. I suppose a group session is cheap – as is talk. They got us to speak into a dictophone, pretend to be lions and do some strange things in the name of science as well as give us impossible tasks, like avoid caffeine and alcohol! No doubt I will thanks them for it at some point…. I got to Burton (smells of Marmite) to catch the train to Newcastle, where I arrived three hours later and checked into the flat, which was overheated, overcramped, but not overpriced! Why they waste heating making them so hot is beyond me….it must create an atmosphere of disease. So I ended up at ‘spit and sawdust’ place. I had chilli and choked on the smoke…..at least had the exercise of uphill walk back. In the afternoon went shopping in the GreenMarket area and then to mum’s hotel room to get changed. She was in the Royal Railway Hotel, right next to the station. 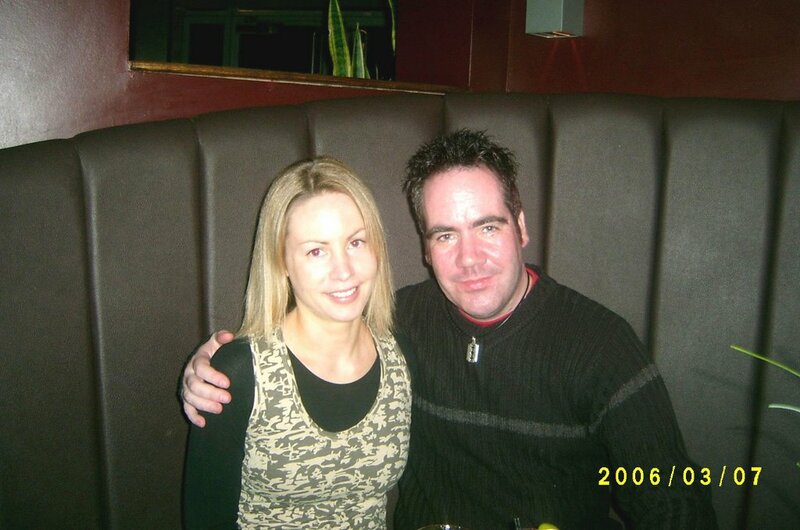 I met Sarah in the lobby – I hadn’t seen Sarah for 5 years and we had travelled together for weeks across the top and down the east coast of Australia in 2000. We went to the Quayside and hit the Piano and Pitcher before eating at ZiZi’s (Italian, lovely olives) and finding an expensive bar on Grey Street called Apartment. She left her bag at ZiZi’s and a waitress called Gemma ran after us and returned it. How cool was that? Whay-aye! We ended up at Mr Lynch’s….which played Kaiser Chiefs and Killers and served Baileys. 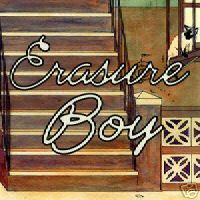 It was very student and indie and took me back to 1993! The taxi man ‘Jed’ is married to a French girl and told us what ‘ZiZi’ means in Francais! Ooops. Someone has a sense of humour. A soft bed is a wonderful thing after a night in a hospital flat. Thanks you Miss S. You are a top chick and I will repay the favour. The next day we did brunch and Starbucks – the perfect way to start a Wednesday – looking at old pictures from our travels, before I met mum at the station – she had been making free use of the hotels spa facilities. The train was full of so many conversations I could have written a book on them – and probably will. But we were sitting by Dr Raj (from TV’s Richard and Judy and This Morning) – the famous phychiatrist. No rest for the wicked as when I got home I had to start working on an application I am doing as I have a meeting about it later today (Thursday.) Oh the joy! Its now Thursday PM and had an active day. I went cycling, went to my meeting in Cannock, went to the gym, rang up Newcastle about changes in medication (I am back on MMF - boooo!) and spending most of evneing on an application form. I just notices I have loads of e-mails so I apologise in advance for not answering them yet. I ahven't checked the local papers yet but believe I have a review of the new Sparks album in The Post this week as well as my usual village stuff. The Mercury are/is also interested in using a feature I wrote about Nunswell Park. So things are ticking over. Pic: My new little car feels the cold! Its not meant to be serious. I just did them as something to cycle to in the mornings. he he. Anyway. How is it going? As you see I picked my new car up on Friday from the dealership. 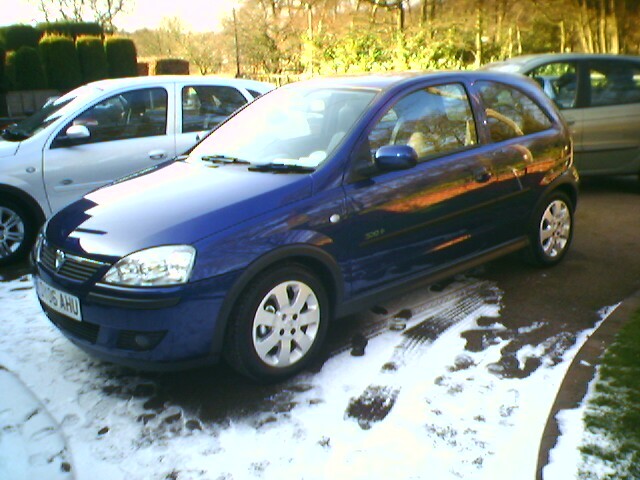 I named it KT Corsa and its CD player was Christened with an Ultravox Album! 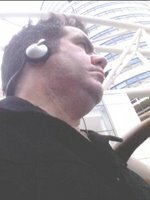 Its now more than a year since I last flirted with death (not including the transplant of course!) My old lungs burst a blood vessel and I was on the floor of a Birmingham bathroom convinced I was close to death. And I was right. I bring this up (well I brought up SO MUCH blood that night..lol) because Uncle B came round to pick up my car with me and he was talking about it. It was my lowest ebb I think...or one of them. Auntie J was coming along (she who got a colt following when she took over this blog when I was in hospital) but she had a cold - I don't need colds c'est moment! I went to the village 'Skittles' night on Friday night. I saw a lad I went to First School with and he is ...guess....a teacher in Taiwan, doing exactly the same as I did in Korea. I also went to get some passport pics done....don't worry I am not going travelling again (yet) but need them for various forms and applications. Tomorrow is Cannock's 'Organic Good Fair' - Cannock and organic, not oft mentioned in the same sentence eh? Oh yes....next time I will tell you about Simon's pop website! lol....Monday I am going to a speech therapist to try and get my voice less hoarse (they reckon it was all the tubes put down my throat during the op!) - then I am off to Newcastle for poking, prodding and meeting up with Sarah. Off now to watch 'Anita and Me' Uber-Yams!!!!! Talking of which...thanks for the letter you...and enjoy the piste! Apologies the last post was a shameless press release but it was for a very good cause don't you think? Last night I went on one of those 'Ghost Walks' in Lichfield with some friends (and some strangers) (and some strangers who may be friends! )..I didn't see any ghosts....bah! The tales of people burned alive sounded almost desirable it was so cold last night! I got to meet most of the Collins clan and the blood lady Jane out of context. Woke up to another lovely blanket of snow - which was not 100 per cent welcome as I had to go to Lichfield to sort out my money transfers for the car. We had a few problems yesterday when the car my mum had bought turned out to be a 3 door instead of the 5 door she had wanted. So there had to be more negotiating. - but she handled it like a trooper. A bizarre thing...I have a had a couple of items of 'fan mail' after my story went in Pick Me Up magazine. Do you thinkg I should write back? 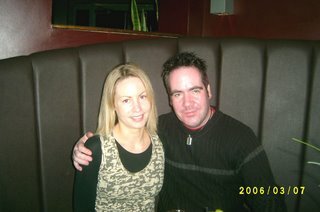 I am having a reunion with Sarah next week (who I travelled down the East Coast of Australia with). I have to go to Newcastle-upon-Tyne for hospital prodding and poking, so it will be something to look forward to afterwards. 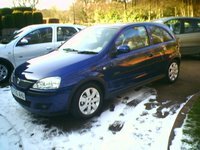 It going to be a busy few days as I pick my new car up tomorrow (see pic on last week's blog) and there is a village 'skittles' do(!) tomorrow night and then Diana's b'day do on Sunday...we are going for a Malaysian (not that the Malaysian knows anything about it!) before heading off to Newcastle. I really do need to spend some time at the gym before I go there too! Perhaps I shall nominate Saturday as a 'Mark' day. A little taster. My friend Simon is a pop-tart of the highest order and he has a great little website. But I am not going to tell you the address (unless you beg) until my next entry (ooer) to keep you hangin' on! This season’s fashion ‘must have’ is to die for…unless campaigner Mark Allen gets his message across in time. The 34-year-old is the first in the Midlands to don the new Live Life then Give Life T-shirt, part of a campaign to highlight the chronic lack of organ donors in the UK. Last year more than 400 people died waiting for a transplant and there are currently over 6,500 on the waiting list. It’s a personal crusade for Mark – who received a life-saving double lung transplant himself last October – but is only too aware that many of his friends still on the list will wait in vain. Mark’s health problems were caused by Cystic Fibrosis, the UK’s most common life-threatening genetic disease, which affects various organs of the body, in particular the lungs and the digestive system. The average life expectancy of a CF sufferer in the UK is just 31 years, with the majority of deaths caused by progressive lung damage. It’s through the Cystic Fibrosis connection that Mark got to know the inspirational duo behind the Live Life Then Give Life campaign – Emily Thackray, aged 21, from West Ewell, Surrey and Emma Harris (32), from Pewsey, Wiltshire. Emily and Emma also have Cystic Fibrosis. Doctors told Emily that she had just 12 months to live without a double lung transplant. 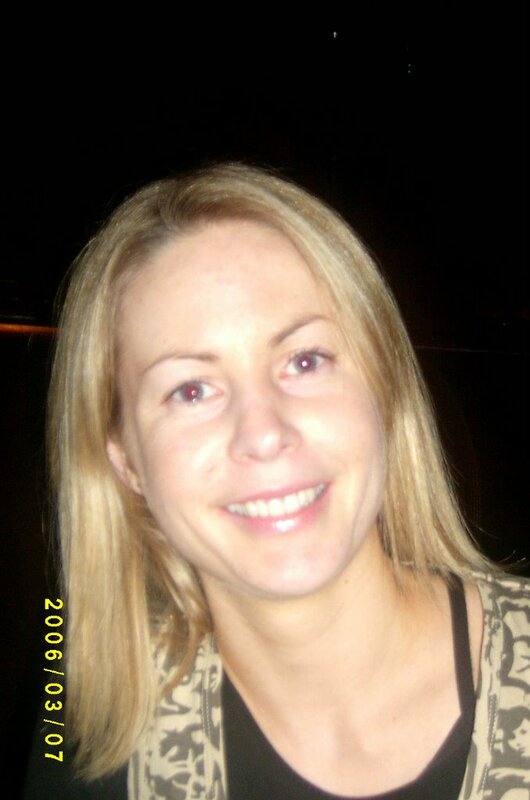 It’s now 13 months on and she is yet to receive her life-saving operation. With time running out for Emily, she and Emma decided to take matters into their own hands with the Live Life Then Give Life campaign and launch of the accompanying website at http://www.livelifethengivelife.co.uk/. Mark added: ”The emotions I experienced after my transplant are impossible to describe. I found myself breathing on my own, with oxygen, with someone else’s lungs; somebody who was no longer with us, but who was living on inside me and fighting hard to keep me alive. It’s thanks to them that I’m ready to take on the world again. Perhaps surprisingly, you are statistically more likely to need a transplant than to become a donor – and yet while the vast majority of people support the idea of organ donation, only 22% have signed the organ donor register. Now Mark is urging others to send out a positive message and encourage people to think and talk about their wishes, by wearing one of the campaign’s specially designed T-shirts, sporting the Live Life Then Give Life message or the cheeky I’d Give You One slogan. The campaign also supports Transplants in Mind, the national charity behind National Transplant Week and the Donor Bus – promoting the positive benefits of organ and tissue donation for transplantation, throughout the year. You can sign up to the NHS Organ Donation Register online at http://www.uktransplant.org.uk/. To find out more about the Live Life then Give Life campaign and T-shirts, see http://www.livelifethengivelife.co.uk/. Mark is available for interviews and/or photos. Picture: Mark’s friends Emma Harris and Emily Thackray promote the Live Life Then Give Life campaign.